Red Tower (tr. Kızıl Kule) is an important monument of Seljuk architecture in Alanya that is often used as a symbol of this city. This structure, beautifully situated next to the harbor, is both a distinctive landmark and the popular photo stop for many strolling holidaymakers. The building looks especially spectacular from the deck of a cruise ship or from the castle hill towering above it. On the other hand a small ethnographic exhibition inside may prove to be very disappointing. 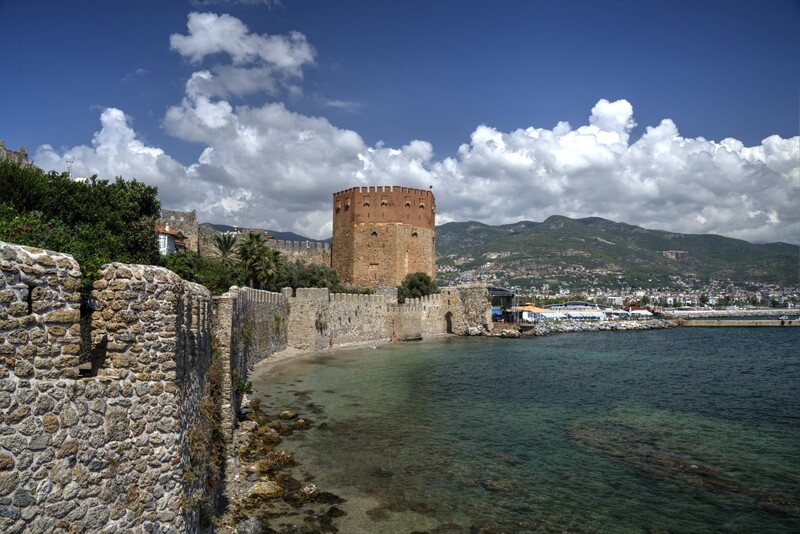 However, Red Tower is worth a visit if only for the vast panorama of Alanya and the Mediterranean Sea that extends from its top floor. A visit to the ruins of the ancient city of Termessos is an unforgettable experience, completely different from visiting ancient cities located along the Mediterranean coast. First of all, to get to Termessos, you need to travel to the altitude of 1000 meters, deep into the Taurus mountain range. The difficulties of this journey are quickly compensated by the vista seen from the ancient theater which is considered to be most ideally situated of all the ancient buildings of its kind in Turkey. Secondly, this Eagle's Nest, as Termessos was called by Alexander the Great, lies in the National Park where the remains of ancient buildings are nestled among pine forest and a number of rare plant species grow undisturbed by mass tourism. Finally, Termessos is shrouded in legends and has been the object of fascination and studies conducted by many travelers and scholars, most notable of them being Karol Lanckoroński - a Polish researcher of Pamphylia who traveled throughout this region in the end of the 19th century. 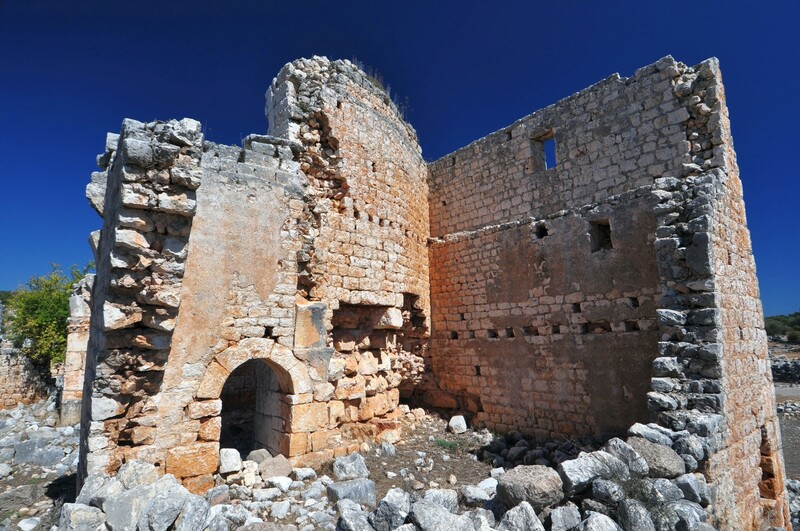 The uniqueness of this place has not gone unnoticed by international organizations - Güllük Mountain National Park and the ruins of Termessos are among the candidates for the UNESCO World Heritage List. This ancient theater, located in the narrowest point of the peninsula where the ruins of ancient Side are scattered, is the greatest of the preserved historical buildings of this magnificent city. A few years ago the theatre was closed to the public due to an extensive renovation, but now it is again open for visitors. 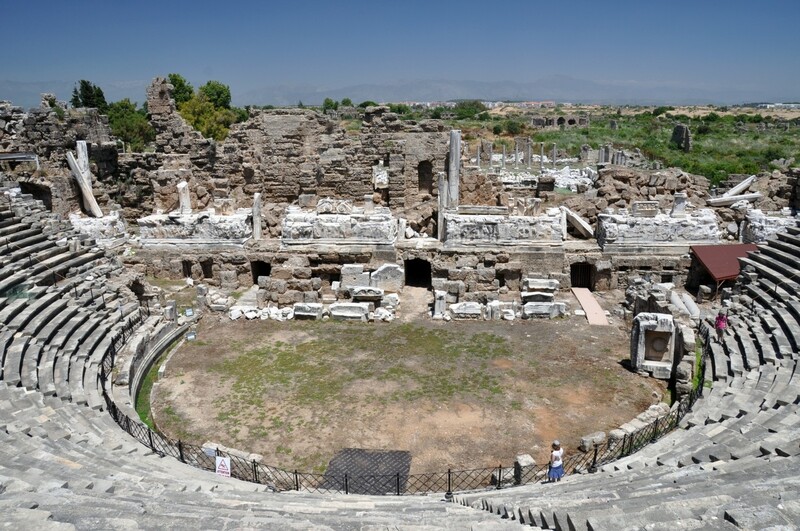 If you happen to be in Side, make sure you will not miss it, as it is one of the finest Roman theatres in Turkey. Who could have guessed that the Alanya area abounds in ruins of ancient cities? Most of the people who come here are vacationers who rarely step out of the hotel and have no idea how many ancient treasures are hidden nearby. 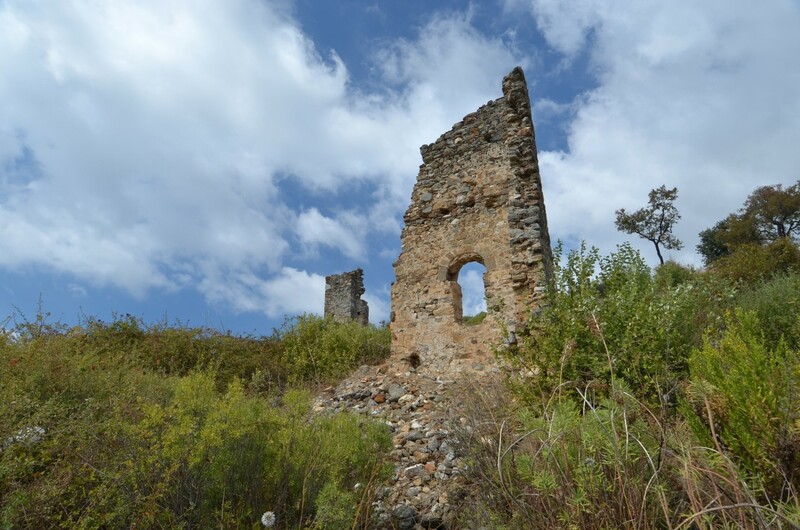 Sometimes, to see them, you have to take a major effort - rent a car, drive deep into the Taurus mountains, overgrown with lush vegetation to find the remains of ancient buildings. However, the case of the ancient city of Naula is different - one just needs to get out of a hotel or a rented apartment in the popular beach resort called Mahmutlar and an unusual sight stretches before your eyes. In the center of Mahmutlar, surrounded by high-rise buildings, there is an undeveloped quarter, and on its premises stand the remains of the old city walls and Byzantine churches. The ruins of the ancient city called Kanytelis are located off the beaten track, far away from popular tourist resorts. Kanytelis, beautifully situated around a karst sinkhole, is not available for users of public transport and therefore rarely visited by tourists. It's a ghost town that comes to life once a year during the International Music Festival in Mersin as some events and concerts are usually organized in Kanytelis.